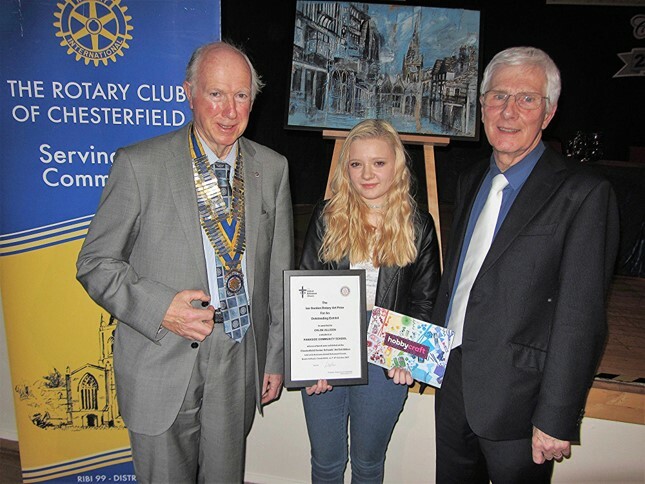 Congratulations to Chloe Allison of Parkside Community School who has been presented, by Chesterfield Rotary president Peter Barr, with the special Ian Gordon Rotary Art Prize for her outstanding exhibit at the 2017 Chesterfield Senior Schools Art Exhibition held at St Andrews United Reformed Church in October 2017. The presentation took place at the school’s GCSE Awards night, held in the presence of the Mayor of Chesterfield, Cllr Maureen Davenport, on Thursday 30 November 2017. 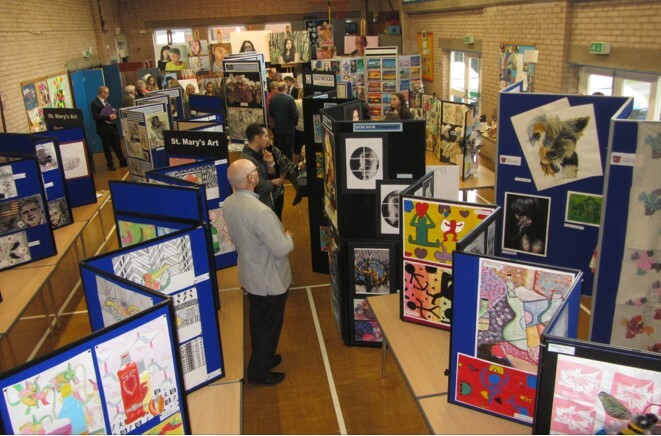 This special Rotary art prize of a signed certificate and £50 art voucher is being awarded in memory of the late rotarian Ian Gordon, who provided the inspiration for the annual senior school’s art exhibition, now in its third year. Chloe Allison’s winning art work is also being used by Parkside Community School as the basis for its 2017 Christmas Card. held at St Andrews United Reformed Church. The winning picture is in the background. 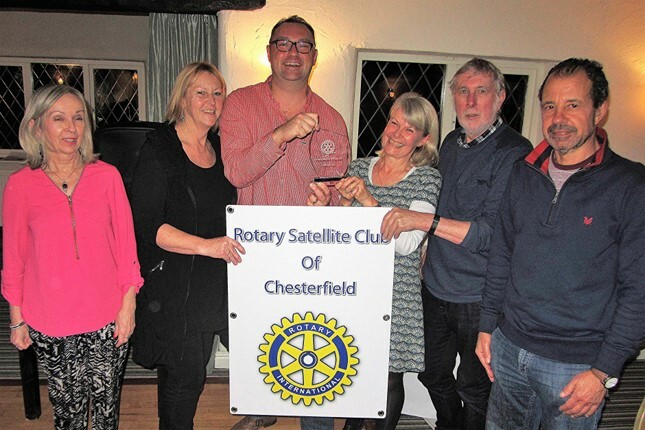 The second annual Charity Quiz Night, arranged by the Rotary Satellite Club of Chesterfield, has raised a record £1,000 for local charities. 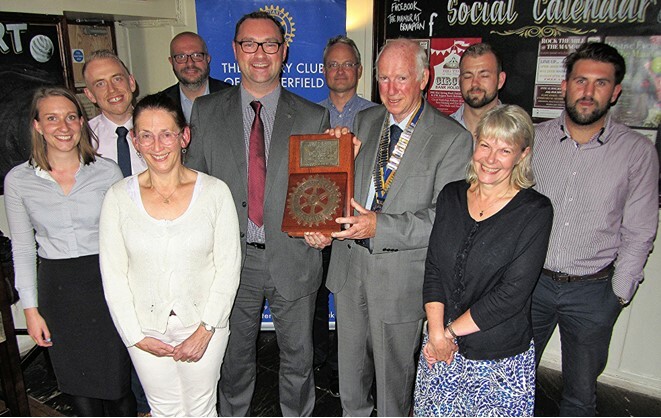 The winning team of ‘DJPAR’, led by rotarian Alison Hankey, received the coveted Rotary Satellite Club Challenge Trophy, which was presented by Satellite Club chairman Peter Blant. The event attended by over 100 local business people, rotarians, and Inner Wheel members, was held at the Fox & Goose on Thursday 16 November 2017. It was organised by rotarian Paul Davies. 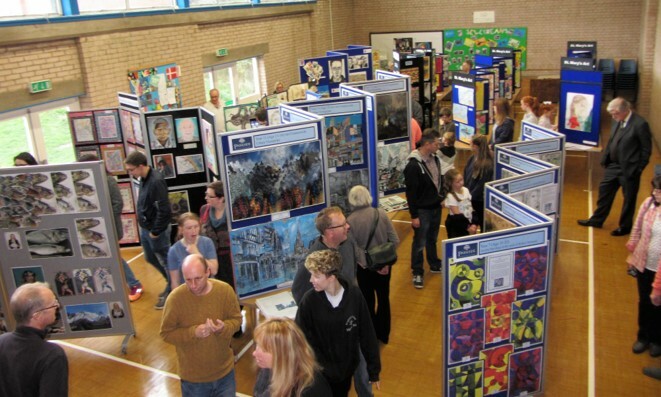 Talented local art students from eight local senior schools were rewarded with a record attendance at this year’s Chesterfield Senior School’s Art Exhibition, which provided a showcase for over 200 high-quality art exhibits. Held over the weekend of Saturday 7th October and Sunday 8th October 2017, it was once again jointly organized in conjunction with local schools, by the Rotary Club of Chesterfield and St Andrew’s United Reformed Church, Newbold Road, Chesterfield, where the event was held. It was officially opened by the Mayor of Chesterfield, Cllr Maureen Davenport, who commented on the quality and variety of art work on display. She was accompanied by the Mayoress, Mrs Liz Archer. Also in attendance were Chesterfield MP Toby Perkins, Chesterfield Rotary president Peter Barr, and St Andrew’s Minister, Rev John Cook, who hosted the opening ceremony. All the art students are being presented with a certificate of participation, and one student is being presented with independently adjudged, Ian Gordon Art Prize for an Outstanding Exhibit. This is in memory of Chesterfield Rotarian Ian Gordon who, as an elder of St Andrew’s United Reformed Church, was the inspiration for the schools’ art exhibition, now in its third year. He sadly passed away just two weeks before this year’s exhibition. The award will be presented at the art student’s own school on a later date. The eight participating senior schools were: Brookfield Community School, Hasland Hall Community School, Netherthorpe School, Outwood Academy Newbold, Parkside Community School, Shirebrook Academy, St Mary’s Catholic High School, Whittington Green School. A Derbyshire hill farmer’s daughter is set to entertain guests at a special 95th birthday celebration with hilarious tales about growing up in the countryside. 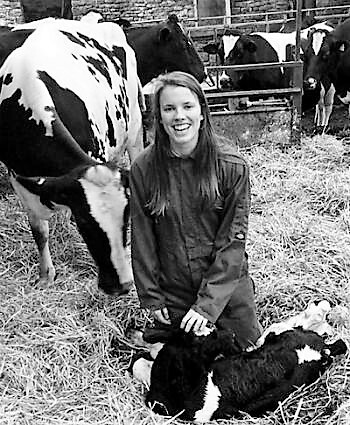 Having been raised on a hill farm in the Derbyshire High Peak, Lydia Slack has now become a highly-rated public speaker and shares her character-building experiences to audiences all over the country at lunches, dinners, and conferences. She will be the guest speaker when the Rotary Club of Chesterfield celebrates its birthday, which is the 95th year since the club receiving its inaugural charter in 1922. The five course anniversary luncheon is being held at Ringwood Hall Hotel on Sunday 5 November 2017 (12.30pm for 1.00pm), and guests are welcome to attend. To book a place contact Mike Cudzich-Madry on 01246 450179 or 07832 130 511. Following on from last month’s update as you all now know the RIBI President Denis Spiller will be attending our Conference at Llandudno this coming year. This is a reminder that Denis has also agreed to hold a question and answer session on what is happening within RIBI at present. So to remind you, if you wish to put a question to Denis, this session will be held on the Saturday Afternoon in the Conference Headquarters Hotel, The Imperial, between 1500hrs and 1600hrs. It will be held on a basis similar to Question Time, i.e. questions will need to be forwarded beforehand and the Rotarian asking the question will need to be in the audience. The only bad news is, is that the hotel can only accommodate a maximum of 75 people so it will be on a first come first served basis. So, come along – if you haven’t already registered for conference and you want to ask the RIBI President any constructive question – get registering now, and submit your question. Any questions should be passed to myself by either email or letter. My contact details are in the District Directory and I look forward to receiving your questions. Todate I have received none, so come on this is YOUR opportunity to question the man himself, and really find out what is happening in RIBI. Calling all district golfers and especially those attending the District Conference in Llandudno this year. Have you booked in for the Conference Golf Competition on Friday 29th Oct 17? Come along with your clubs and play one of the premier courses in North Wales, tee times still available. Special discounted rate of £40 per player which included coffee and bacon cob. Prizes for both Female and Male Golfers together with Longest Drive and Nearest the pin prizes plus the District Trophy for the overall winner. We still have tee times available. Add this to a great Conference Weekend so get booking now. Contact Lorraine McGlone if you wish to add this to your registration or speak with the golf organiser Jack Anderson of the Rotary Club of Retford. If you know youngsters between 15 and 17 years of age, please let them know the Registration will be opened soon for them to register their interest for next year exchanges with Rotary. The two programmes we will be running are the Short Term Exchange up to three weeks and Camps. If anyone requires more information, please contact Cas Francis on email: cas@casinspireme.com. Remember to Exchange with Rotary you must register with RI or RIBI. 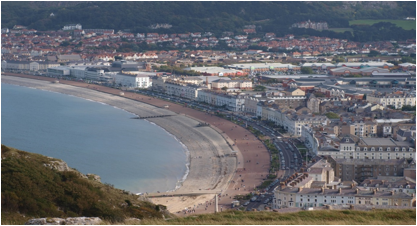 YOUR District Conference is being held in Venue Cymru one of the most prestigious Conference Centres in the United Kingdom. Our Conference Speakers will include our RIBI President Dennis Spiller and Geoff Miller a hugely respected figure in the world of cricket, along with Malcolm Wells MBE and Canine Partners, Gordon Mould CBE of KidsOut, and Andy Cole will “Inspire you to be Happy”. We will hear from David Ellis and Barney Callaghan, Molly Youd and Fiona Bassett informing us about what can be achieved within Rotary and Emma Jones from The Childrens Air Ambulance plus be motivated by hearing from some of our own Clubs of what they are achieving! Members of the recently formed Rotary Satellite Club of Chesterfield have significantly contributed to a prestigious award presented each year to only one club in Rotary District 1220, which covers 69 Rotary clubs throughout Derbyshire, Nottinghamshire, South Yorkshire and parts of Lincolnshire. The Gordon Taylor Trophy for the Best Club in District 1220 has been presented to Chesterfield Rotary Club by District Governor Michael Longdon, not only for its varied programme of charitable events, but mainly for being the first club to set up a thriving satellite club of busy younger business people in the town. Chesterfield president Peter Barr shared the success with satellite club members at their July monthly meeting held at Brampton Manor. For more details about the Rotary Satellite Club of Chesterfield contact secretary Rachel Trueman 07792 719 238. 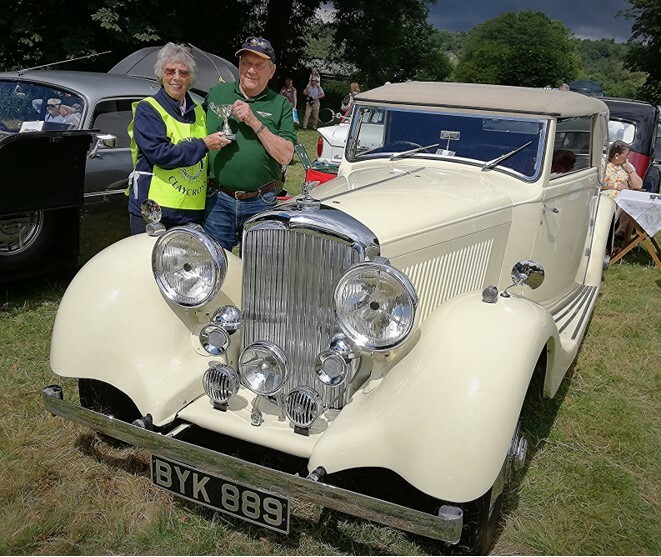 There was another good attendance for this year’s Ashover Classic Car & Bike Show held at Rectory Fields, Ashover, on Sunday 23 July 2017. Hundreds turned out for the show which is organised jointly by the Rotary Club’s of Chesterfield, Chesterfield Scarsdale, Clay Cross and Matlock. The event raises thousands for local charities. Best car was a 1935 Derby Bentley Park Ward Drophead 3 1/2 litre owned by John Wilkes from Wingerworth. 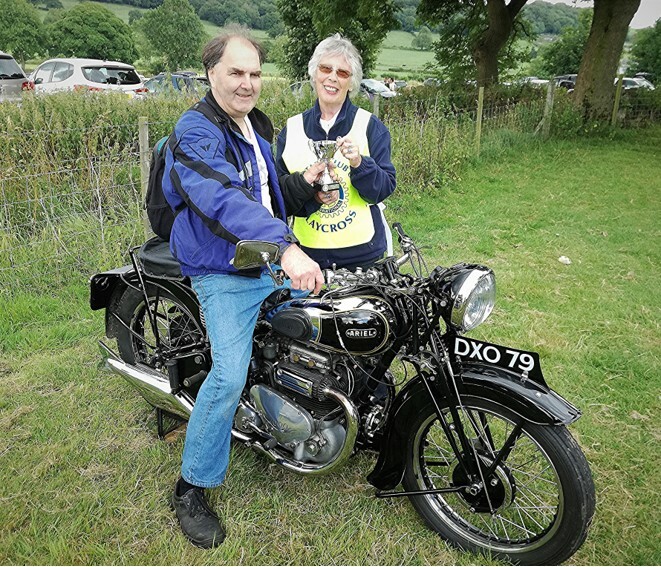 Best bike was a 1937 1000cc Ariel Square Four owned by Peter Kirkman from Matlock. Trophies were presented to the two winners by Clay Cross Rotary president Sally Jackson. Rotary wishes to thank everyone who supported the event.